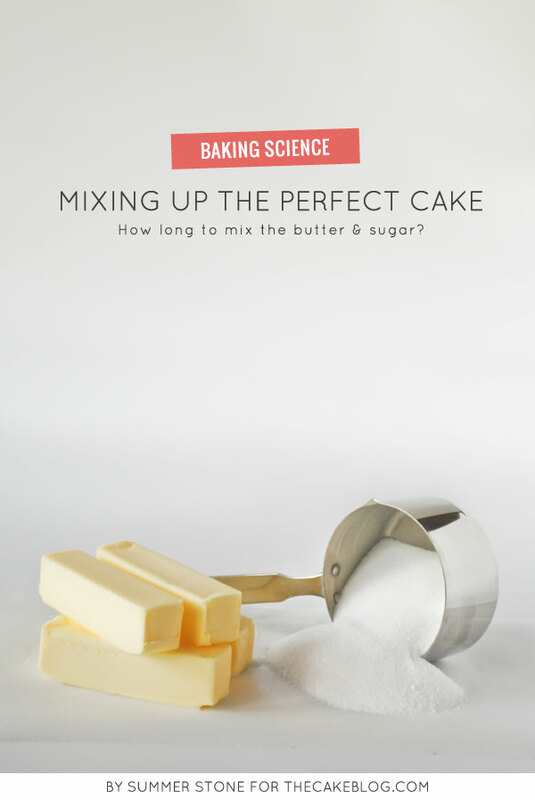 Our contributor, Summer Stone of Cake Paper Party, is back today with a new baking science experiment…. Sweeteners play a critical role in any cake recipe. They not only impart the sweetness that makes a cake dessert fare but also have a hand in the structure and leavening processes. The most common sweetener in cakes is granulated sugar, but sometimes other choices are fitting for a particular recipe. Here we will take a look at how differing sweeteners affect the properties of a cake. The sweeteners I have chosen to use include granulated sugar, superfine granulated sugar, brown sugar, fructose and stevia. TASTE: Sugar provides sweetness to the cake. TENDERNESS: Dissolved sugars interfere with gluten formation, starch gelation and protein coagulation which result in a “weak” or tender cake. Too much sugar can weaken a cake to the point of collapse. MOISTURE: Sugar is hygroscopic by nature and attracts water molecules, increasing the effective moisture level in a cake. 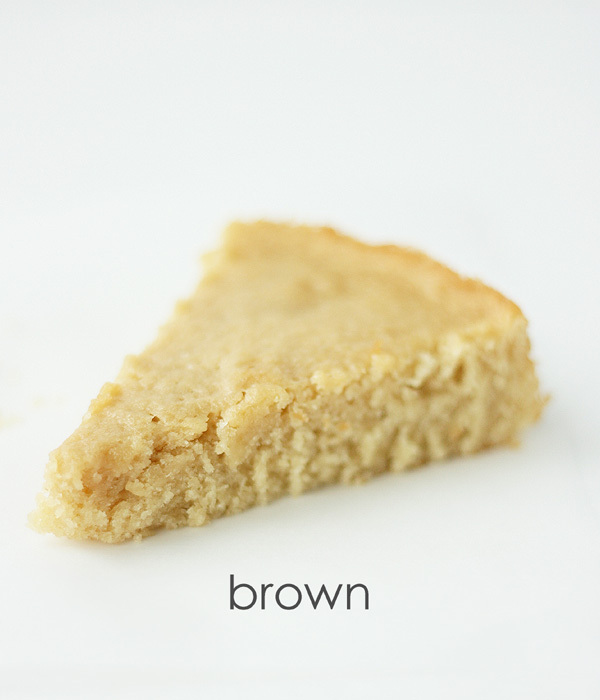 BROWNING: Caramelization of sugars and Maillard reactions allow browning of the cake crust and impart a golden, “baked” flavor. LEAVENING: Sugar carries air between the crystals which plays a role in leavening processes. In addition, the irregular shape of the crystals can allow air to be “dragged” or “driven” into the cake batter in the creaming process. The size of the sugar granules as well as the type of sweetener will determine the manner in which the cake properties are affected. 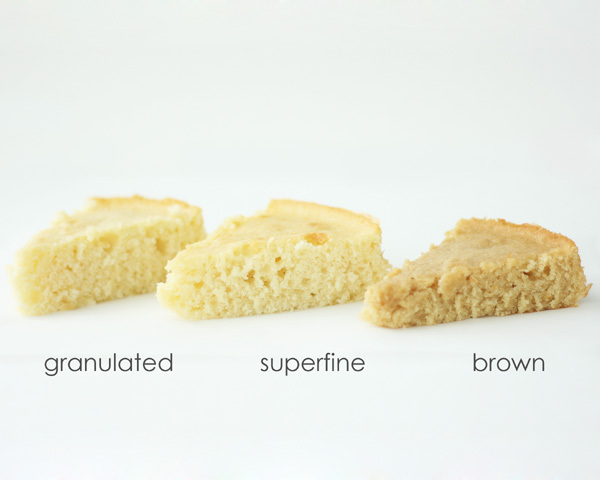 Let’s take a look at some examples of sweetener variation and the impact on the final cake. 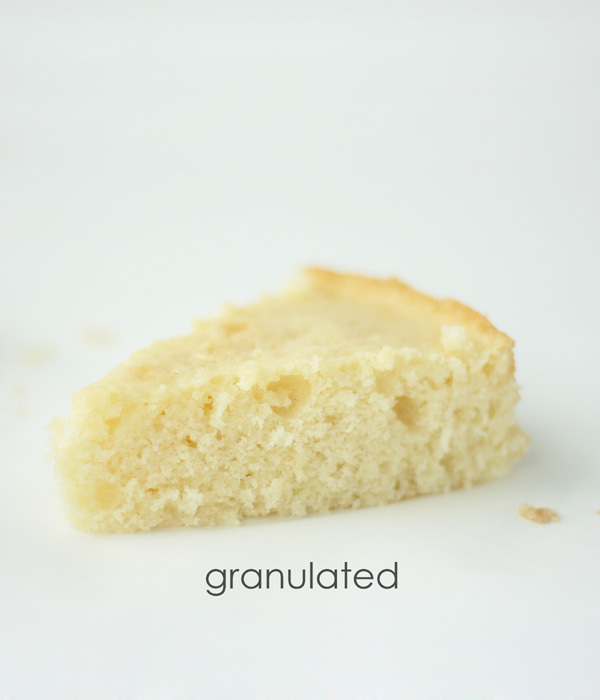 Granulated Sugar: This standard cake sweetener provides for a light, tender crumb and maximum height of the cake layer. Superfine Sugar: The smaller crystals of this variation of granulated sugar allow them to dissolve faster than their coarser counterpart. 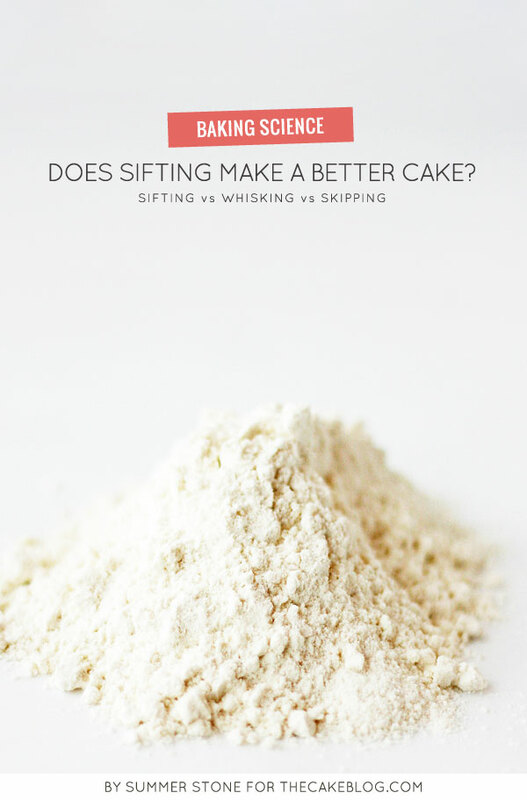 This results in more rapid and effective disruption of structural components and a slightly shorter cake layer than that of granulated sugar. Small air cells from these small crystals also have a bit of an effect on leavening. Brown sugar: This sugar is similar to granulated sugar but retains or has a bit of molasses or refiners’ syrup added. The molasses present in this sweetener provides a distinct flavor and pale beige color to baked goods. The presence of molasses’ syrup also provides a ready-dissolved sugar that further adds to the tenderness and perhaps moisture of a cake. This cake layer was shorter than both the granulated and superfine sugar. Fructose: Sweeter than granulated sugar, this sweetener gives a unique flavor to baked goods. 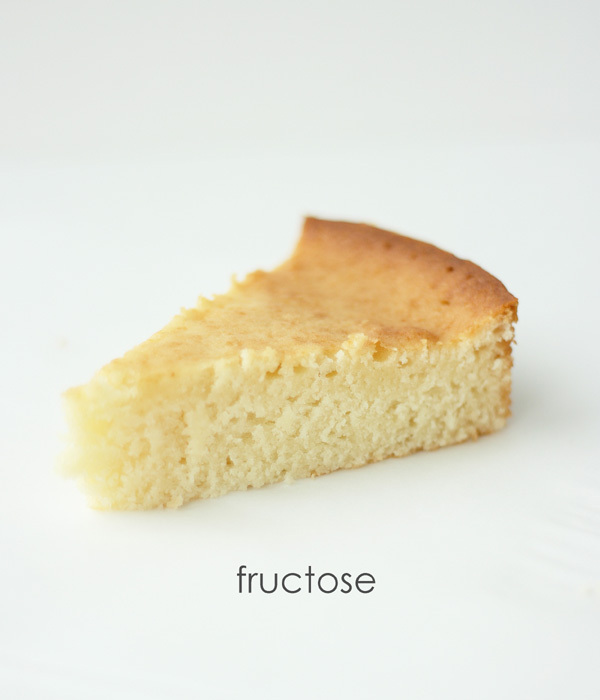 In addition, fructose promotes browning which gives the cake a “toasty” taste. Fructose is also highly hygroscopic (water attracting), which allows a cake made with this sugar to retain moisture over time. The fructose cake also had a tight crumb and was shorter than the granulated sugar cakes. 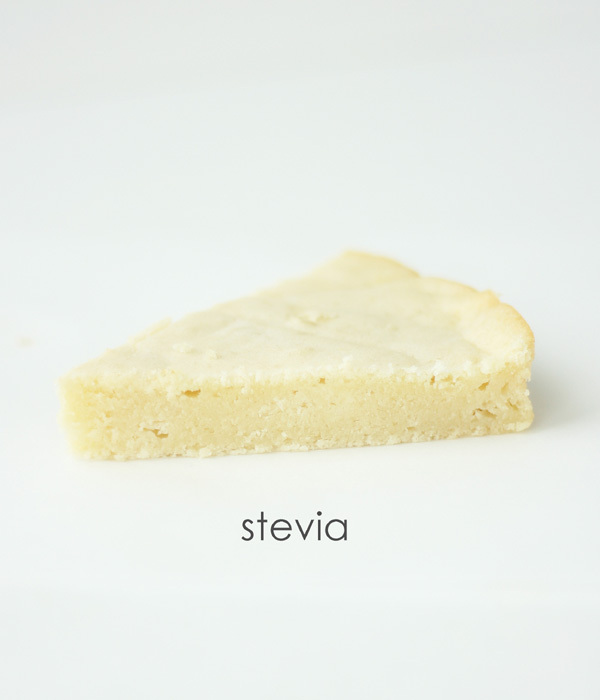 Stevia: The importance of sugar can be clearly seen in a cake made without it. In my opinion, stevia, on its own, is a poor substitute for sugar. The cake that resulted was pale and cracked on the top with a very tight, compact crumb, short layers and a bittersweet flavor. If you choose to reduce the sugar in your cakes, I would recommend using no more than half of an alternate sweetener. It appears that granulated sugar is still the gold standard for most cake applications. 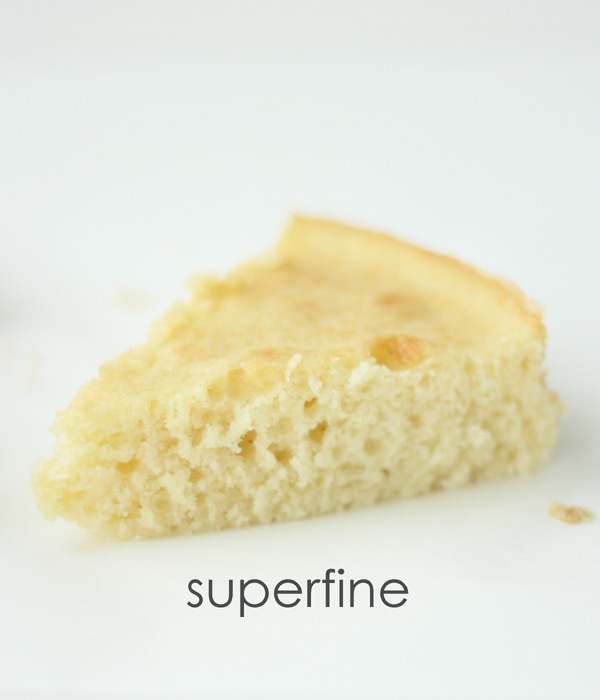 Superfine sugar can be used but weakens the structure of the cake a bit. Brown sugar adds a warm, butterscotch flavor but also weakens the cake structure and is less fluffy than the granulated and superfine sugar cakes. Fructose could be used in a cake for those with dietary restrictions, but I would not recommend using stevia alone because of the taste and structural effects. 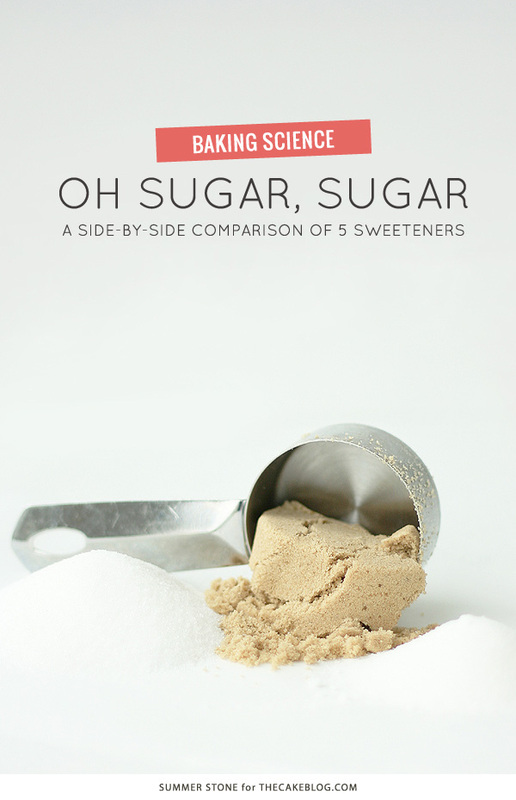 I hope this helps you make decisions about sugar in your recipes. Now read my article, Mixing Up The Perfect Cake. See exactly how long to mix butter and sugar together! Next see If Sifting Makes a Better Cake. I think you’ll be surprised by my results! 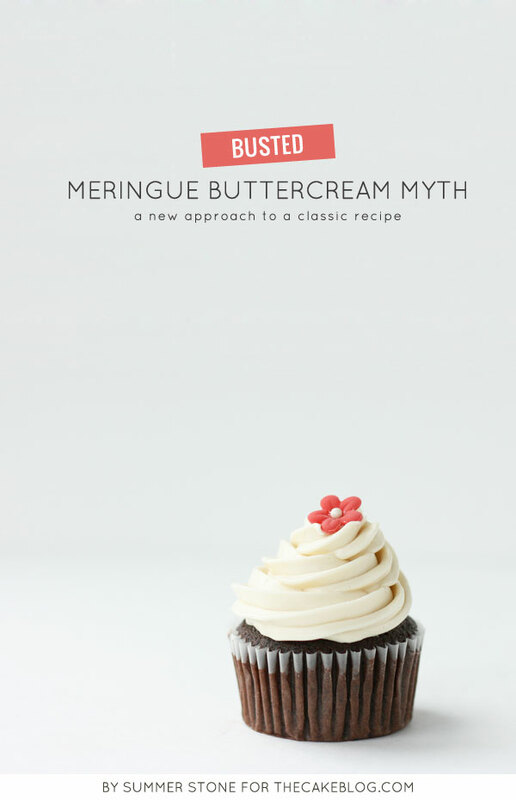 And don’t miss my article, The Meringue Buttercream Myth! It’s a unique new way to make Swiss Meringue Butterceam. 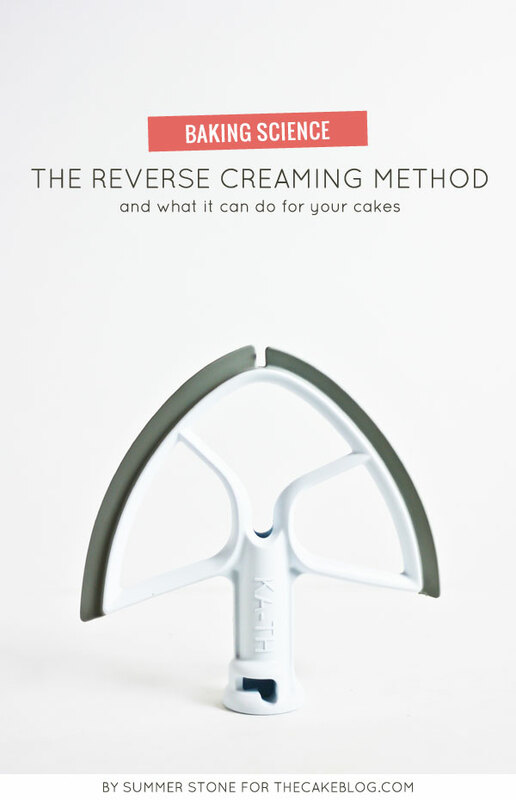 and see what it can do for your cake recipes! Thank you for this information. However, granulated, refined sugar is the most damaging to the body. Stevia is a natural herb and does no harm. We have to move from what simply looks good and what is actually good for the body. There are recipes using Stevia that are just as tasty as sugar. The cakes here look really yummy. I really think using brown sugar is a great idea as it taste so good and give it a different taste to white sugar to.